Delightful stone & clapboard Cape style home, beautifully set on .53 acre of private, quiet property w/room for a pool! 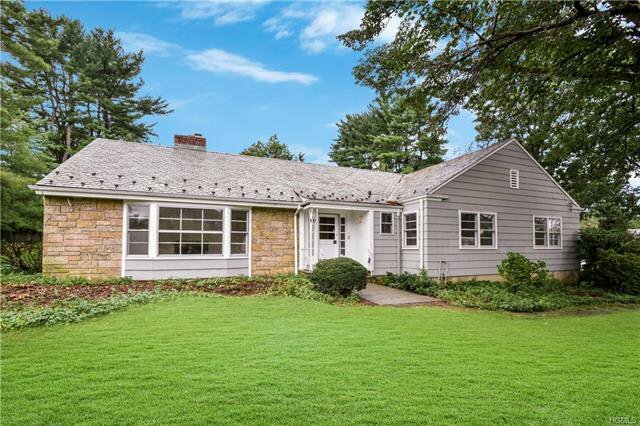 Remodeled in 2000, this 5 BR, 3.1 BA home in sought-after Quaker Ridge location features an open floor plan, hardwood floors, large windows & sunny rooms. A spacious EH welcomes guests & opens to a grand LR w/FPL. The formal DR & updated EIK both access a screened patio, great for indoor-outdoor entertaining. Fam Rm w/custom blt-ins offers a wonderful gathering place. The MasterBR w/huge WIC & MBath is on 1st LVL, along w/2 add'l BRs, full Bath & Pwdr Rm. 2nd LVL has 2 more BRs & hall Bath. Lower LVL incl 544 SF finished recreation space w/8ft ceilings & fireplace. 2-car att garage, gas heat, CAC, tons of storage & expansion potential. Spectacular Japanese Maple & mature flowering perennials. Close to town pool, tennis courts, golf, restaurants, shops, fields & playground. EZ walk to E/S. Free bus to Scarsdale Middle & High Schools. Only 29 min to NYC via Metro North!